Happy Spring! I made another yarn wreath! My obsession with them continues! But there is something so pretty about yarn wreaths, and I love the ones I made for Valentines Day and for Winter. So, I thought I needed a bright, pretty one for Spring! I made another cute little wreath hanger. I had fun with different flowers. And added a couple of tiny little yarn balls. I used a 16 inch styrofoam wreath. From my experience, these are the best for lining up yarn. 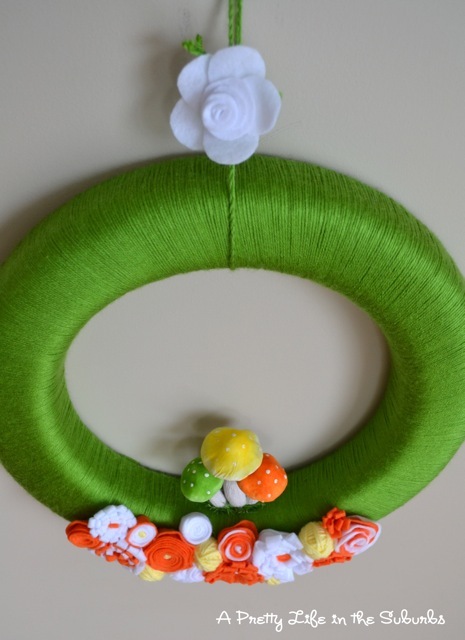 How to wind the yarn around the wreath: There are a number of options on how to do this. I chose to do my winding quite precise, with each string lining up neatly with the next. I wrap it twice. It’s tedious, but the end result is worth it! 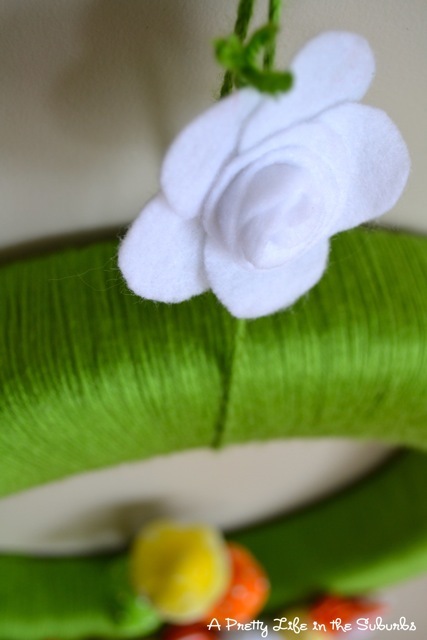 You will also need about 3 sheets of felt for the rosettes. For the flowers I made, I used 2 sheets of orange, 1 sheet of white. For the flowers, I adapted the tutorials from the blog Craft Snob. Her tutorials are excellent! 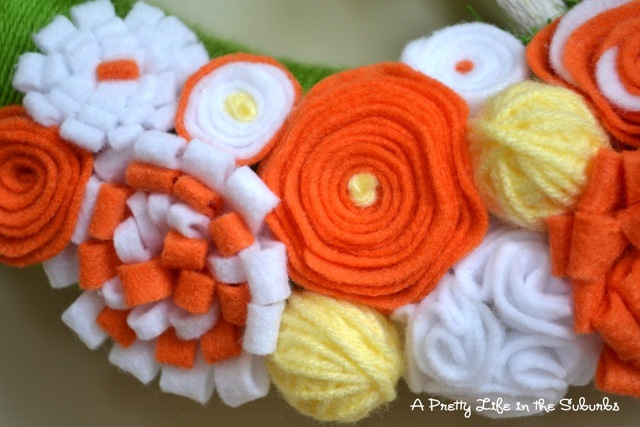 Once you get comfortable with how to make the rosettes, you can get creative and make your own style of flowers! For the yarn balls, I used 4 mini styrofoam balls, and wrapped them with yellow yarn I had already. 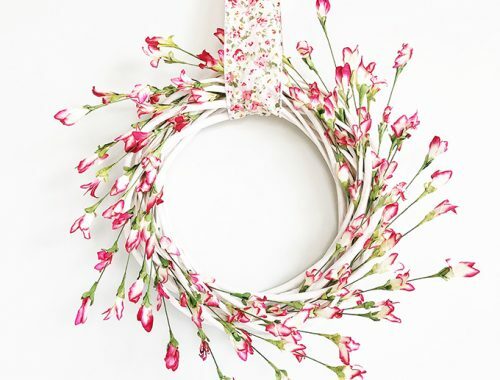 Then add little embellishments to make your wreath beautiful! I loved these little toadstools the moment I laid eyes on them at Pier 1. Then for the finishing touch, I made my own wreath hanger. I just braided 3 string of yarn, wrapped it around the wreath, tied a knot, then added my own little flower! Too cute! You got it so perfect! I’m jealous. I’m in the middle of a yarn/rosette wreath. I love how bright yours is. So so pretty and cheery! You sure are good at these! OMG! I love this!! Those are the words that came out of my mouth as soon as I saw this. This is the cutest wreath ever. I just made a mickey mouse yarn wreath for my sons birthday it pales in comparison to this though. How do you get the yarn so tight? Oh. My. GOODNESS! This is the freaking cutest wreath EVER! I am absolutely in LOVE with it!! Great Job!!!!!! One of my favorite yarn wreaths ever!!! Those toadstools are the cutest! OMG. Are you serious? This is fabulous! It’s perfect. Following! I’m new to your blog and completely in love! Thank you so much for sharing this amazing project. I’m totally inspired!! this one is awesome! I love the toadstools!! P.S. I’m your newest follower. This is amazing! I think I’m going to make it my desktop backround so I can stare at it all day!! LOVE. IT. Love flowers and mushrooms. so adorable and so unique. The colors are fabulous as well. Well done!!!! 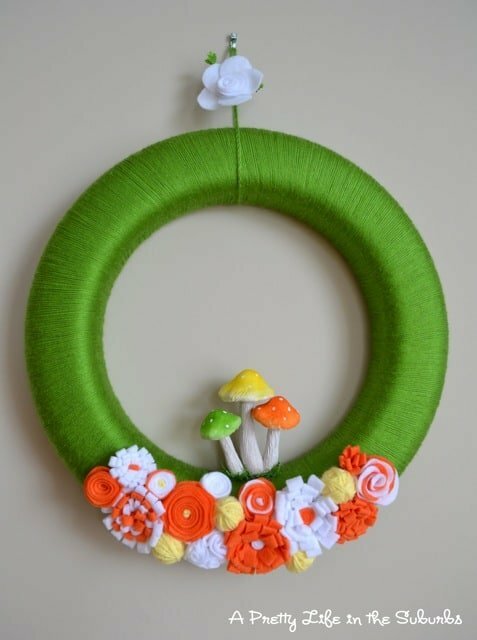 One of the cutest spring wreaths I have seen. Trying to figure out if I really could make this… Thanks for sharing! This has me pining away for sprint – I love the colors, I love the textures and the mushrooms are to die for! 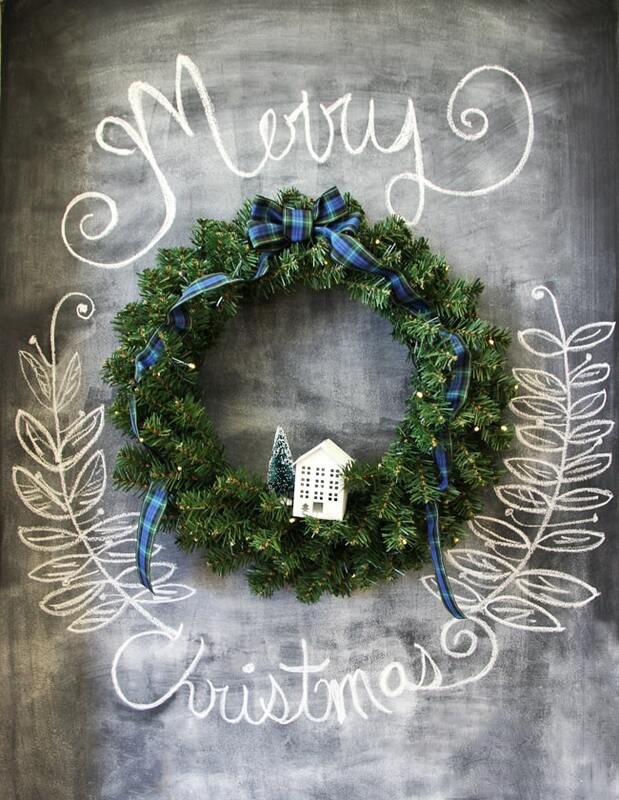 I love your wreath, it is adorable – enjoy the labors of your love! That’s so cute! I love the way the toadstools are growing out of the flowers! I love the mushrooms! So cute. So cute! I just adore it! absolutely gorgeous! love the combo of orange and green!!!!! I love how it turned out too! The flowers and little toadstools are so cute!! Ah! I’m not the only one obsessed with them! They are so addicting! Adorable! I love the punch of orange! This is the most beautiful handmade wreath I have seen!! Great job! 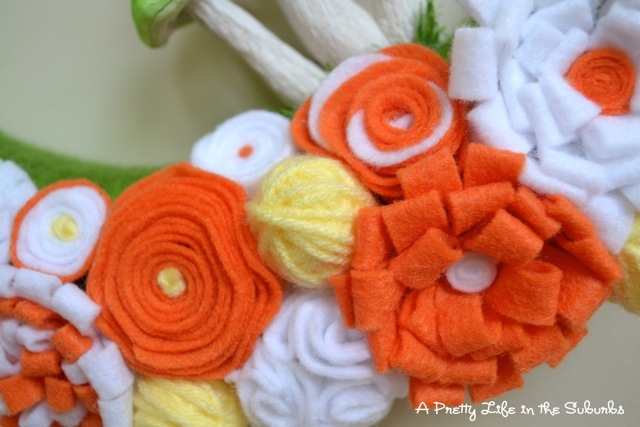 So many things on this wreath have been done before, but not with this perfection, color combination and composition. Thank you for the inspiration. Love the colors you used. The toadstools just make it ten times more cuter! I am having a gibeaway on my blog. $38 + free ship from busy little hands to buy a cute kid backpack from her store. She has tote’s for mom too.Do check it out. 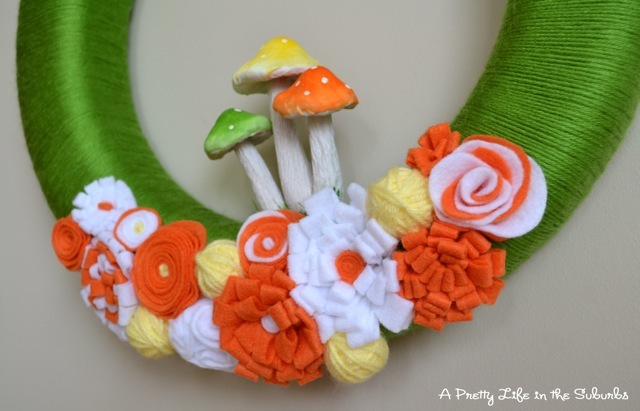 So many yarn wreaths…I really need to give this a try! 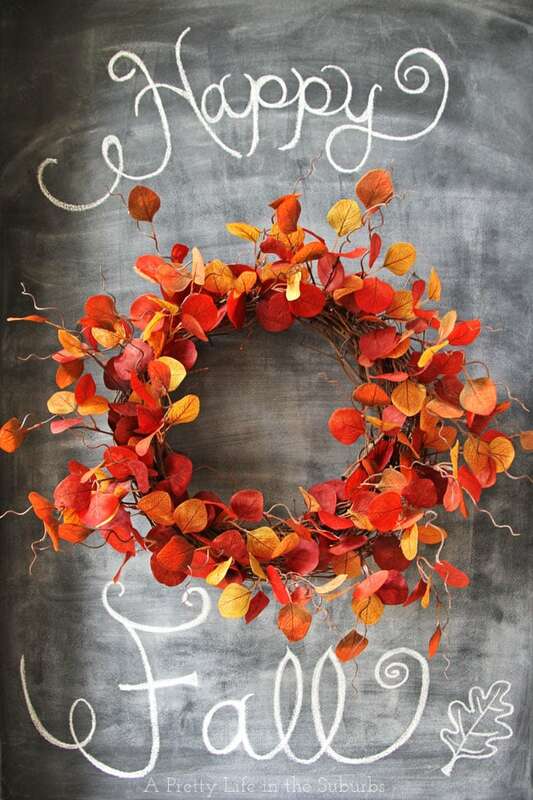 I love your wreath…especially the colors. i truly honestly LOVE this in every way possible! oh wow….this is super great! i absolutely LOVE it! thanks so much for sharing the tutorial…i’ve got to make it! thank you thank you!!! I’ve been seeing this wreath everywhere and I LOVE it! I’d love it if you’d link up at my new Tuesday Time Out link party! Wow! It looks AMAZING! 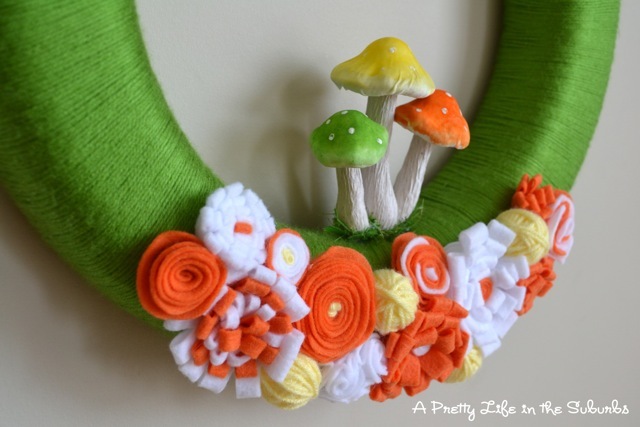 The colors are perfect for spring and I love the little mushrooms! I would love for you to stop by and link up to my Ten Buck Tuesday link party (it lasts all week)! okay soooo cute!! I’ll be linking! Gorgeous! Love the bright colors & those cute toadstools. This is so much fun! I love this! 🙂 Love the little yellow yarn balls. Wow! This is lovely. Hope to see you at My Dream Canvas!